I finished Richard Flanagan’s new novel The Narrow Road to the Deep North some hours ago today, and I am still overwhelmed by it. The novel is the story of a man tested to the limits as a POW on the Burma railway, and although I have read The War Diaries of Weary Dunlop and A Doctor’s War by Rowley Richards, nothing could have prepared me for the visceral experience of some of the scenes in Flanagan’s novel. There were times when I just had to put it down and read a bit of dear old Balzac or some children’s novels for school until I could face continuing. Thoughtful haiku* interspersed throughout the book seems incongruous until it becomes apparent that the poetry represents the duality of the Japanese tormentors. It’s almost as if the author could not bring himself to show these characters as capable of human goodness in any other way. (Flanagan’s own father was a Japanese POW, the book’s dedication names him as POW no 335). Just as the central character Dorrigo and his men on The Line represent human frailty as well as heroism and selflessness, the Japanese characters are also depicted as complex beings; their brutal behaviour is shown to be the product of Japanese military training (which is consistent which what I’ve read in Tears in the Darkness by Michael Norman and Elizabeth M Norman). The narrative shifts in time, place and perspective to show that these characters are not sadists in the sense of taking pleasure in inflicting pain; they are more hidebound by their beliefs about obedience to a chain of command that leads to the god-like Emperor. Like Dorringo they yearn for an innocent past that is gone forever, and like him they never adjust to everyday life afterwards. But Flanagan does not shrink from depicting their post-war refusal to accept responsibility for their war crimes and there are a couple of post-war scenes that depict violence that had nothing to do with Imperial demands. Dorrigo is a magnificent character. In civilian life before and after the war, and during the pivotal years of his life on The Line, he is torn between desire and duty. His passion for Amy vies with his duty to Ella; he struggles to reconcile his role in meeting the demands of the Japanese for slave labour with his role as a doctor in the men’s survival. Post-war he becomes the public face of the atrocity and its aftermath yet paradoxically he yearns for relief from the boredom of his dull marriage and everyday life. Through him we learn the fate of some of the survivors, and we see examples of seemingly inexplicable behaviour from men who were told to go home and forget about it. This is a meticulously crafted book, as you can see from the Sensational Snippet that I posted last week. There will be an avalanche of books about war this year, the anniversary of the start of ‘The War to End all Wars’ in 1914. But by tracing the POW experience from different angles The Narrow Road to the Deep North and Thomas Keneally’s Shame and the Captives contribute to a richer understanding of defeat. The Japanese treated their POWS as slave labour to build a symbol but their captives were ennobled by it; the Australians at Cowra treated their Japanese POWS well, and their captives felt shamed by it. 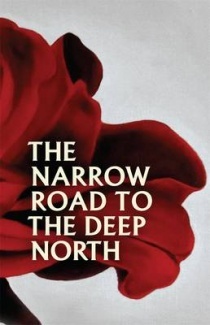 The Narrow Road to the Deep North has been reviewed widely: See Romy Ash at The Guardian; Susan Lever at The Sydney Review and Michael Richardson at the Newtown Review. Update: John Boland’s review at Musings of a Literary Dilettante is superb. Check out Tony’s too, at Tony’s Book World and Sue’s at Whispering Gums where she notes the generosity of this book. *BTW a reviewer at the Japan Times quibbles about the translations of some of these haiku. Stock seems to be scarce at Booko but but you can pre-order the reprint. It sounds brilliant, Lisa. I plan to buy it at the Perth festival and attend the session he’s doing on it. Oooh, Amanda, I am so envious. Flanagan is such a brilliant author, just being in the same room with him is a privilege! Have you read David Malouf’s Great War? I still remember POW scenes from that novel as if I read it yesterday and it must be 20 years ago when I read it. Goodness, Kim, I was overwhelmed when I read the book and now I am overwhelmed by listening to the podcast. That moment, where Flanagan explains about ‘The Lizard’ and the interviewer is so taken aback, is profound. Ah yes, I have read The Great War, but I think that Ransom is closer in spirit to this novel by Flanagan. Maybe as Flanagan says, an author needs time to live a life and discover more about humanity before being able to write profound novels like these ones. By coincidence Sue at Whispering Gums has just written a post about forgiveness, and it’s one to mull over. I am mindful of an old man I know who was a Japanese POW. In his 90s now, he is wracked by guilt because he feels he ought to forgive, and he can’t. The tragedy is that on top of everything else, he is burdened by the expectations of others that now that he’s coming to the end of his life, he should be able to do it, as if we, who’ve never had whatever his experiences were, have some kind of moral authority to expect it. But who can know? Will he feel better if he can forgive, or will be wracked by guilt about betraying memory? I like the way Flanagan talked about memory and forgetting and how his father in the end was able to forget. He didn’t say this, but it was as if his son’s actions offered a kind of redemption that he could live with. Apropos our thoughts elsewhere about The Luminaries, It’s this kind of soul-searching that I cherish about great novels. This book is due to be published in the UK very shortly, and I’ve noticed quite quite a buzz about it on twitter. Great review, Lisa – it sounds amazing. ‘quite a buzz about it’, even…not sure where that extra ‘quite’ appeared from! Sounds as if this book was unlucky to miss out on the Miles Franklin. Hmm, yes, I was torn between this one and Alexis Wright’s The Swan Book to win it. Both of them are books that will last long past my lifetime. Lisa, you’ll no doubt be pleased to know that this book has made the Booker long-list. Perhaps it will have a little better luck there than it did with the Miles Franklin. I’m *very* pleased to hear it! I like what The Observer had to say: “a classic in the making”. I’m returning to Australia for the first time in ten years this August, so I’ll be taking a copy back to Barcelona with me. I missed your review the first time round because I hadn’t even heard of the book yet – started hearing about it this summer I think. Then a group chose it and I read it – against my better judgement. – Ha! So much for my “better judgment.” Just because the blurbs say “war” and “love” does not mean I’m going to dislike it. If that many folks say it’s terrific it might be wise to withhold judgement. Then after I finished I was going to go back and check reviews but I missed yours for some reason. Now, thanks to Sue reminding me, I’ve got it! Thank you! Yes, the inclusion of the Japanese point of view was very different and riveting – original – beautifully done. This book is very ambitious but it works. LOL it’s disconcerting when we find that ‘our better judgement’ lets us down. I tend to think that I’m pretty good at choosing books I’ll like and rejecting the dross, but every now and again a book confounds me. I reckon this one would have confounded many because as you say, ‘war and love’ tends to set my antennae twitching too. But in my case, and *broad smile* for many others from now onwards, the name Flanagan overcomes any doubts. The blurb could say the book was about toddler taming and I would read it anyway! !